Denim remains one of the essential fashion staples in everyone's wardrobe. Jeans can come in dark, medium or light washes, as well as a variety of cuts. Bleaching your jeans is a fantastic way to personalize and soften the denim in a pair of jeans in just a few hours. The washer is the perfect basin to complete the bleaching process. Fill the washing machine with warm water and add about one quart of liquid bleach to the warm water. Start off with a small amount of bleach to test how the fabric will react to the chemicals. Place the jeans in the washing machine and allow to soak for about 20 to 40 minutes, depending on how light you want the denim to be. Do not leave jeans to soak for too long, as the bleach may start to compromise the threads in the fabric. Drain the washing machine. Wash the pair of jeans on a regular cycle in warm water, with a mild detergent and a large cup of fabric softener. The softener will remove the crusty feel from the bleached denim. Allow the jeans to dry on a flat, even surface for about half a day, until they are completely dry. 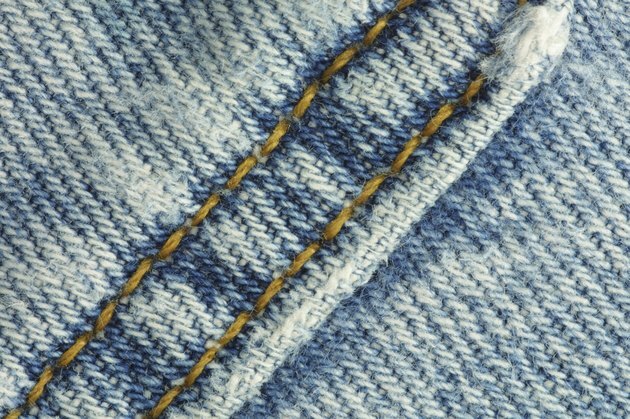 Wash a new pair of jeans a few times before beginning the bleaching process to break in the denim fibers.